Aven Ace B. was born at the University of Iowa Childrens Hospital in Iowa City, Iowa on October 22nd, 2015. His mother Krista, father Allan, sisters Kassie, Ashton, and brother Axel. lived at home 115 miles away in Ankeny, Iowa. Krista and I have a hotel room that we pay for that is actually in the hospital and have been staying there since about Halloween. Our jobs allow for flexibility and one of us have been with Aven every day since he was born except for 7 days. Those days we called in other family members to share in the responsibility. So Krista and I rarely see each other and travel back and forth many times a month taking turns working and with Aven. Aven was born with a Giant Omphalocele. 12 days after he was born part of his small intestine kinked and that required immediate surgery. He then spent the next 2 months having 18 other surgeries to repair and make sure the repairs were healing properly. To say this 2 month period was stressful and terrifying would be an understatement. He slowly has continued to heal and we really have finally come out of the woods. Not that everything is perfect. But from where he came from is astonishing. He now is eating green beans and sweet potatoes. He loves physical and occupational therapy when they come. He also really likes the music therapist. 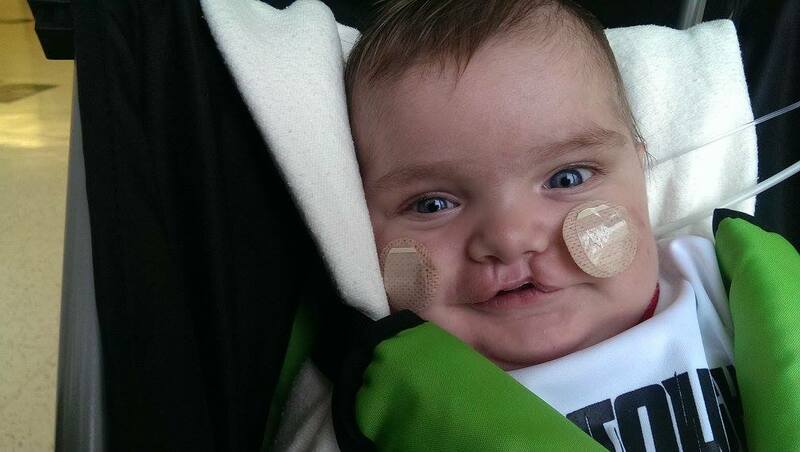 He has a small cleft lip and has a repair surgery scheduled for May 24th. The hope is that since he has progressed so well, that a couple weeks after this surgery he will actually be able to come home. It’s a path we’ve had to take in being with our son helping him get thru this. But the emotional toll it has taken on everyone in our family has is overwhelming. We were told in the beginning it would take a village to get thru this. That’s an understatement. From other family members helping out or neighbors doing what they can, to our employers and co-workers working with us on our sometimes short notice needs. Aven will get to come home soon. We are fortunate. Then in a year or two he will have a final surgery to finish putting his liver back inside of him. By the time our little boy is able to go to school, he will be a normal little boy. He just happened to be the turtle in this race is all. But he will finish the race. Krista and I thank you for your support. You can also follow along with Aven on his Facebook page, Avens Journey.